Thoughts for the Listening Heart is a collection of poems that delves into the spiritual situations of life. 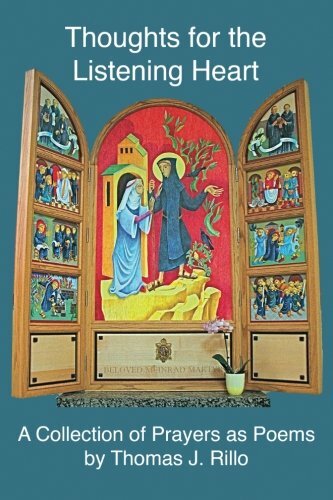 The poems are arranged in eight topical sections such as 'Living Icons of Christ,' 'He hears Our Prayers,' 'Ministers of God's Word,' and 'Clothed for the Journey.' These poems may be read and studied as devotional readings, by small prayer groups, and as a meditative reading in the same way as "Lectio Divina." It is hoped that reading of these poems will inspire and encourage others to expand their love and appreciation of God. Brother Martin is a Benedictine monk of Saint Meinrad Archabbey in St. Meinrad, Indiana. He is recognized throughout the monastic world as a talented liturgical artist. He works in a variety of mediums such as: ceramics, pottery, furniture, figurative art, and his special work with stained glass windows. His art reflects the beauty of the symbol, the richness of color, and his knowledge of theology. His liturgical art speaks to the soul.